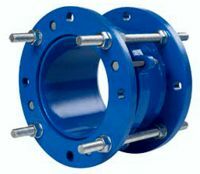 HD-1 and HD-2 Flanged restrained dismantling joints are double flanged fittings that allow longitudinal adjustment in a pipe system when maintenance is required. They provide greater flexibility at the planning and installation stages of flanged pipe systems. Flanged restrained dismantling joints are particularly suitable for simplifying the installation and removal of valves, pumps and flanged pipes and fittings. Typical applications for pumping stations, water treatment works, sewage treatment works, plant rooms, meter chambers, power generation equipment and gas distribution stations. They are available from DN 50 mm up to including DN 1600 mm. Flanges can be drilled to suit various international standards including ANSI for pressure classes PN 10, PN 16, PN 25 and PN 40. Accommodates up to 50 mm / 2” longitudinal adjustment. Allows for fast and simple maintenance of valves and pumps. Simplifies future pipework modifications and reduces down time. Installed with a spanner and a torque wrench, no special tools needed. Accepts some misalignment in straight pipes.